Roger Thorson stands in an open doorway on the main floor of his restored barn, his blue eyes bright under a shock of snow-white hair. Audience members wander around the barn’s makeshift performance space, sipping on chilled water laced with peaches from Thorson’s orchard. Six thick, angled support beams and endless gnarled wooden boards naturally frame the stage, and everything in the space—guests, wooden beams, chairs, even the nesting box dotted with owl poo—is pierced with strips of streaming sunlight. Punctuated by large white sails strung in between the barn supports, the entire room gives the impression of being in the hold of a giant ship. This dedication is also the thesis for CabinFever’s whole tour. Jacobs and her company of three dancers and one composer will visit a previously chosen residence, talk to the inhabitants about their experiences in the space, and then create music and choreography based on those conversations. Added to the fact that the artists don’t even see the locations until mere days before the shows, CabinFever’s goals are hugely daring. The project is Jacob’s answer to a frustration with the inaccessibility of traditional stage performances, where the audience occupies one space and the dancers occupy another with the understanding that one group will observe the other without responding save the expected applause at the end of a performance. I met up with Jacobs two weeks before the performance (and two weeks before anything was actually choreographed) to talk about how she intended to combat that inaccessibility and create a connection between her company and the audience. She explained that the performance would be less of a literal translation of stories told by the residents and more of an artistic response to “the sacred symbols of a home, the heartbreak and ecstasy of family life.” Jacobs aims to capture these symbols through installation pieces comprised of dance, music, art, and “riffs on the existing structures.” In Salutations, the existing structure is the 1906 barn constructed by Thorson’s Norwegian immigrant great-grandmother, and the symbols are extracted from his stories are about experiences growing up on the farm with his mother, grandmother, and great aunt. There are, however, no obvious illustrations of the stories themselves. The dancers respond to the ways of life that Thorson described during their many conversations, but overall it seems that the artists’ own impressions of past decades—not the resident’s—are prevalent in the choreography, music, and set design. In the first of two acts, composer Doug Barber’s bluesy guitar pickings reverberate through the barn as he recites poems found in his grandfather’s journals. Barber’s words are indecipherable, a faux-backwoods muttering punctuated by the sounds of the three dancers (Emily Craver, Sarah Lustbader, and Emily Pacilio) sliding and rolling across the floor. As the dancers rise, they recite lists to themselves in what gradually becomes a round of phrases: “These is a list of the things I carried: your doubt, my doubt, a toothbrush…” Large white sails strung in between the barn supports, created by designer Katherine Ranieri, capture the nautical feel of the structure and space. Both acts are very short and the audience spends more time wandering the barn and grounds than watching the performers. The second act touches on the ship theme. Dressed in flowing blue jumpers, the dancers lean backwards on the slanted support beams, transfer their weight forward on tiptoes until they fall forward, rushing toward the next beam or bouncing off the white sails. 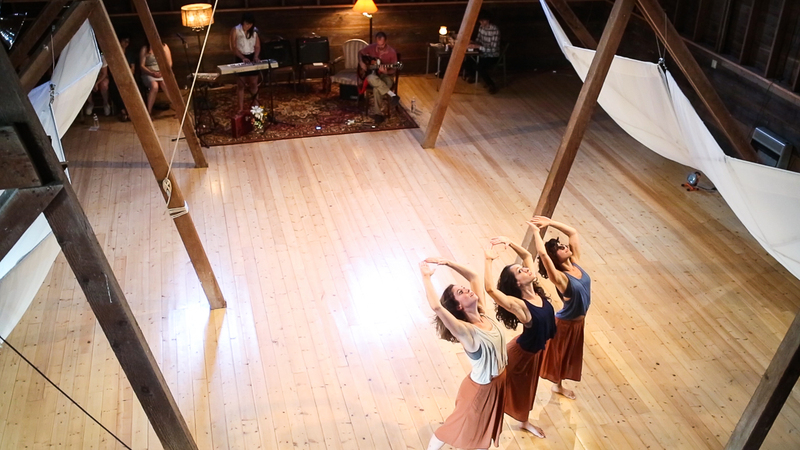 The ethereal voice of singer/composer Anna Goren rises above the pattering of feet, and the hold of an immigrant ship is born on this second floor of the old barn. The effects are powerful and entertaining, but whether they hold to the thesis of honoring the current resident’s memories and experiences is questionable. It’s a huge undertaking to translate years of professional dance and choreographic study into a representation of others’ personal histories. Jacobs spoke of Thorson’s experience in the artistic process as leaving him with a “strong, heavy heart,” which speaks volumes about the intimacy that a performance site resident shares with CabinFever audiences. Jacobs may have only touched on Thorson’s personal history and stories in this CabinFever installment, but with solid dancing, unique choreography and smart musical compositions, Salutations is, at the very least, beautiful and extremely interesting. More information on CabinFever is available at cabinfeverliveart.com.